18th August 2011. Because Dads are so special we know most of you will be thinking about Father's Day coming up. Allow us to show you a couple of great ideas in this special edition newsletter, featuring some of our very best deals and some new products too! Yes we know it's not yet been a fortnight since the last newsletter but as promised we have a special edition this week for Father's Day. Because Dads are so special we know most of you will be thinking about what to buy, or perhaps you're more concerned with what you might receive?! Either way, allow us to show you a couple of great ideas including Books, DVDs, Apparel, Outdoor and Vehicle Gear, as well as a great range of navigation products. Below you'll see we’ve put together some of our best ever specials and some great new products to help you with your father’s day shopping, but don't forget to use Wishlist if you find suggestions to send to your friends and family. Next week, we'll be back on track with our regular newsletter format - and we have heaps of exciting new content and tools ready to announce. The Hema Navigator is the ultimate navigation system for any self-drive traveller in Australia. Combining Premium Street, 4WD and Topographic Navigation into 1 GPS Unit, plus fantastic bonuses like 2 years of free street updates and compatible trip planning software and mapping for PC, this is the perfect Father’s Day gift. From now until Sunday the 4th of September the Hema Navigator is now available from the Online Shop for only $844.95 or $800 for members! This is a great deal offering up to $99 off the RRP, but won't be available at this price for long. Now available are some fantastic new Outback Heritage and Inspirational Travel Titles published by Penguin , Viking and Black Inc. These books include The Bushies , Outback Pioneers , Australian Ballads and Short Stories, The Drovers, Jackaroo and Journeys to the Interior, and have been handpicked to offer you the best titles to inspire and inform you about regional Australia’s heritage, culture, and the experiences of others who have explored the region. As a special Father’s Day offer, you can order all six of the great new titles listed above in our Australian Stories Pack for only $139.95 or $131.29 for members, that’s over $40 off and it’s only available until September 4. Back in stock after a period of unavailability is the Camps Australia Wide 6 – Mega B4 Camps Snaps Edition. Camps 6 is considered one of the best resources for travellers available, and the Mega B4 version also includes pictures for over 1900 of the over 2500 sites listed. To celebrate the return of this great book all Camps Australia Wide products are now 10% off until September 4. Membership is a great gift (comes with a notepad, member card, and sticker, plus extras for the Lifetime option). BONUS TIP: If you are a Member, you can purchase Lifetime Membership (for yourself or a friend) at the reduced price of $270. To buy for others, all you need is their name, delivery address, and their email address. This long awaited 3rd Edition features a Full Hema Road Atlas, Tips from Experienced Travellers, Trip Maps and Notes and over 1000 Caravan Park listings. Will it get here in time? 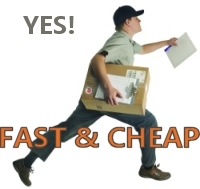 Next Day Delivery is FREE for all orders over $250 or a maximum of just $9.95. Members Next Day Delivery price is FREE for orders over $125.